Students at the University of Pennsylvania’s Wharton school have designed a graphene-based way to measure ground water contamination from leaking fracking fluids. As wastewater from fracking potentially contains toxic materials, there is a concern that it might leak into drinking water and contaminate it. The Penn students' plan is to use graphene to measure minuscule amounts of hydrocarbon benzene – a known carcinogen. 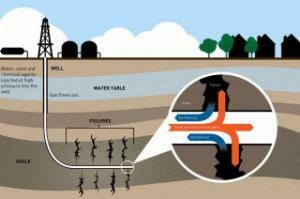 Benzene remains in the ground after drilling and might be transported by groundwater. Despite being deadly, benzene is difficult to measure since it occurs in fracking fluids in very low concentrations. Using graphene, the students can measure benzene even in picomolar amounts (as graphene is several millions times thinner than a piece of paper, which allows it to have a high surface to volume ratio). The students are finalists in a competition, and say that if they win the prize money, they will also receive a commercial license from Penn nanotechnologies, which has a physics lab dedicated to graphene production.